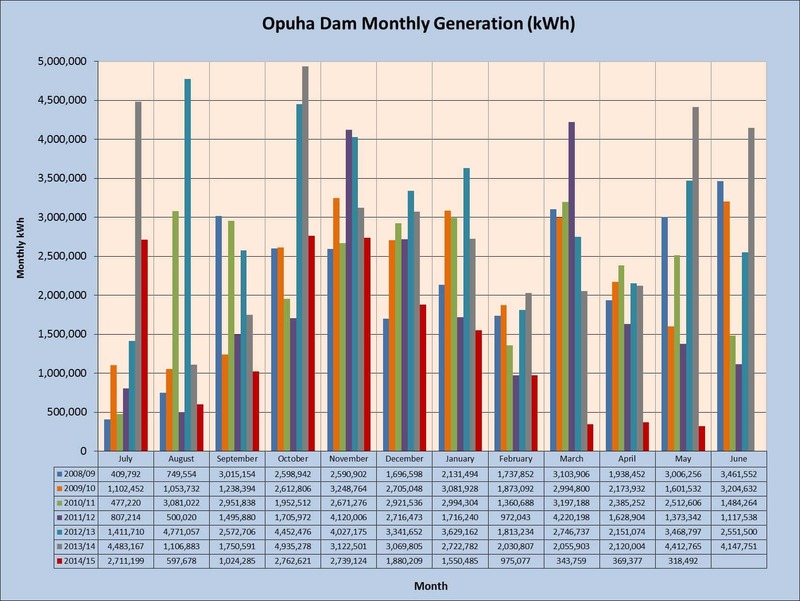 The Opuha Dam facility includes a 7MW hydro station at the base of the dam that generates electricity with all the water that is released from the lake storage. The power station provides a valuable contribution to the local electricity network and the revenue from the electricity sales accounts for approximately half of the company’s income. The power station operates every day but the amount of running is dependent on the amount of water that is required for the river downstream. The water from the power station discharges into a large ‘regulating pond’ and then a control structure at the bottom end of the regulating pond (the downstream weir) regulates the amount of water released into the Opuha River. This arrangement means the power station can operate intermittently at full load to get the best electricity price while the flow into the river is managed at a consistent, natural level. The power station is operated and maintained under contract by Trustpower. The station is monitored and operated from their Control Centre in Tauranga and the maintenance support is based at Lake Coleridge approximately 60km north west of Methven and 170km from Lake Opuha. The electricity generated from the power station is sold under a Power Purchase Agreement currently with Pulse Energy. The electricity connection is into Alpine Energy’s network and onto Transpower’s national grid via the substations at Fairlie and Albury. The amount of electricity generated annually is entirely dependent on the hydrology of the catchment (lake storage and downstream water demand). The output can vary considerably from year to year and for any particular month. The graph below gives an indication of the historical variability.